This post was featured in IYP2016.org. Micronutrient malnutrition because of iron and zinc deficiencies is a serious public health problem in low-and middle-economy countries worldwide. In India alone, about 80% of the pregnant women, 52% of non-pregnant women, and 74% of children in the 6-35 months age group suffer from iron deficiency. About 52% of children below 5 year are zinc deficient. Iron deficiency causes varying degrees of impairment in cognitive performance, and learning ability, lowered work capacity, and pregnancy complications (e.g., maternal mortality, and babies with low birth weight). Zinc deficiency in children causes stunting, makes them vulnerable to diarrhoea, pneumonia, and can lead to death from these infections. 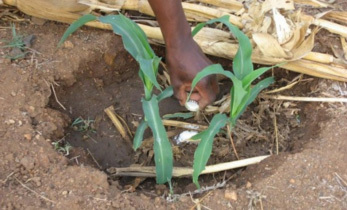 Crop biofortification, which refers to the breeding of cultivars with higher levels of micronutrients, is increasingly being recognized as a cost-effective and sustainable approach to overcome these deficiencies in the food chain. Spearheaded by HarvestPlus Program of CGIAR, global crop biofortification research was initiated by several CGIAR centers on 12 crops, including pearl millet. This has led to several success stories based on which HarvestPlus was recognized with the World Food Prize in 2016. 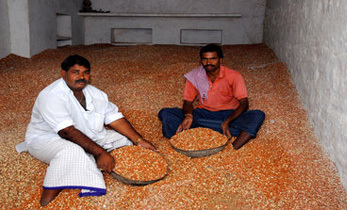 Under the biofortification program, the International Crops Research Institute for the Semi-Arid Tropics (ICRISAT) and Mahatma Phule Krishi Vidyapeeth jointly developed a high-iron variety of pearl millet, called Dhanashakti, which was released in 2012 in Maharashtra and later in 2013 across India, making it the first mineral biofortified product of any crop cultivar released in India. Dhanashakti has 71 mg/kg iron and 40 mg/kg zinc. It was rapidly adopted by farmers, reaching 65,000 farmers by 2015. The seed of Dhanashakti is available with Nirmal Seed Company and State Seed Corporations in Maharashtra, Karnataka, Telangana, Uttar Pradesh, Haryana and Rajasthan. 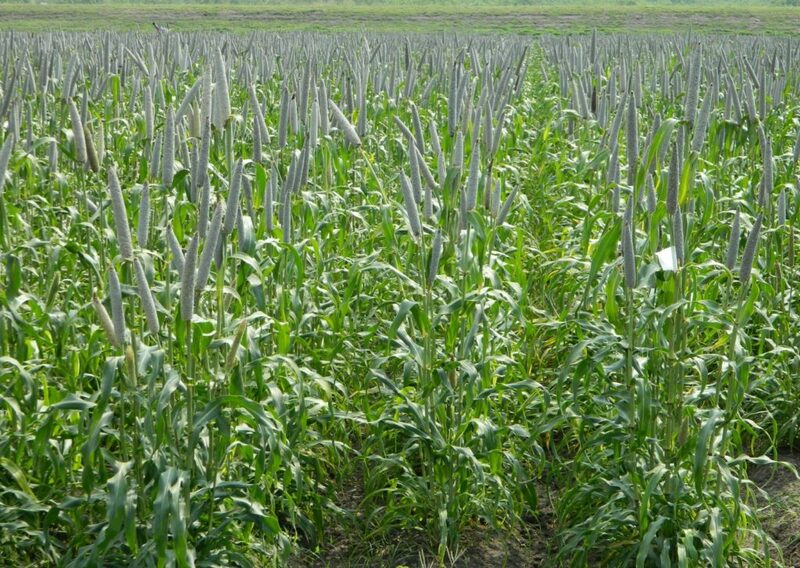 ICRISAT has also developed a high-iron pearl millet hybrid (ICMH 1201), which is being marketed, using Truthfully Labelled Seed (self-certification), by ShaktiVardhak Seed Company under its brand name Shakti 1201. This hybrid has 75 mg/kg iron and 40 mg/kg zinc (similar to Dhanashakti), but it has more than 30% higher grain yield than Dhanashakti. In 2015, Shakti 1201 was adopted by more than 35,000 farmers. The iron levels in the two biofortified cultivars are much higher than those reported in most of the released and commercial cultivars, which have less than 50 mg/kg iron. The zinc of these cultivars is marginally higher than many of the released and commercial cultivars. 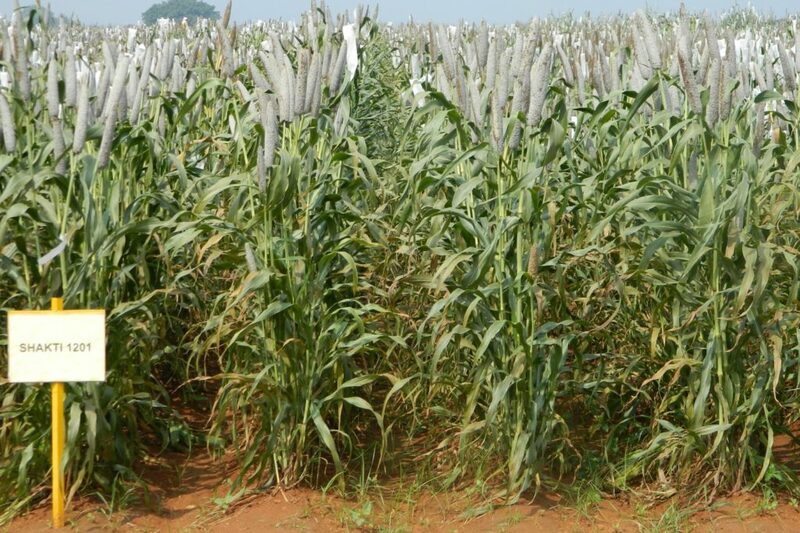 Thus, when talking of pearl millet grains as a rich source of iron and zinc, as commonly assumed, there will be a need to talk in terms of specific cultivars. In this context, it should also be noted that these biofortified pearl millet varieties have much higher iron content than the best biofortified rice varieties (less than 5 mg/kg). And many, but not all, also have much higher iron content than the best biofortified wheat varieties (less than 40 mg/kg). Similarly, many have much higher zinc content than the best biofortified rice varieties (less than 25 mg/kg), but only a few have higher zinc content than the best biofortified wheat varieties (less than 40 mg/kg). The food uses of biofortified pearl millet varieties will go a long way to reduce iron and zinc deficiencies. For instance, based on feeding trial estimates of 7-7.5%bioavailability of iron in whole grain food, and assuming 240 g/day of grain consumption, Dhanashakti and Shakti 1201 would provide much more iron than the daily requirement of 0.84 mg in men, and meet 70% of the daily requirement of 1.65 mg in non-pregnant and non-lactating women, and 42% of the daily requirement of 2.8 mg in pregnant women. Above grain consumption rate will also provide 80% of the recommended daily allowance of 12 mg of zinc. 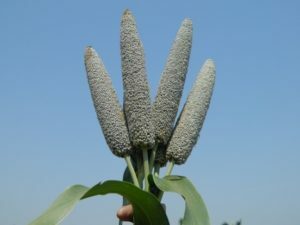 Besides reducing the iron and zinc deficiencies, pearl millet has recently been gaining increasing attention as a climate change-resilient and Smart Food crop on account of its high levels of tolerance to drought, heat and soil salinity; and several nutritional traits such as high protein content with more balanced amino acid profile, high dietary fiber, gluten-free protein , and phyto-chemicals. Finally, a word of caution: these biofortified pearl millet cultivars have been developed using natural genetic variability in pearl millet, and they are not GMO products. The author is a Consultant with HarvestPlus, International Center for Tropical Agriculture (CIAT); and Former Principal Scientist and Director, HarvestPlus-India Biofortification Program, ICRISAT. He can be reached at: K.Rai@cgiar.org. 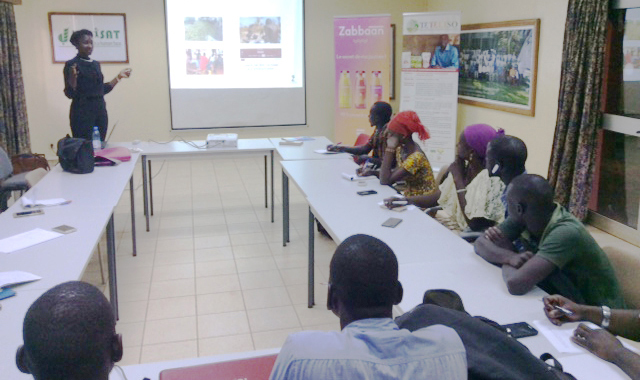 Ms Aissata Diakite, an incubatee of Mali Agri-business Incubation Hub (MAIH), won an entrepreneurship contest for her project Zabbaan Holding that produces juices (smoothies and cocktails). The juices have a shelf life of one year and can be stored at room temperature without losing flavor or taste. The production, transformation, standardization, marketing and distribution processes of the products is all done locally in Mali. Ms Diakite represents a group of 10 Malian young entrepreneurs living in France. She has won the contest of the Mali Diaspora Entrepreneurship Program during an event organized by Fanaday Entertainment on 10 September at Bamako. Ms Diakite has returned back to France for the acquisition of processing equipment for her new enterprise. MAIH has assisted in the preparation and the feasibility studies of the winning project. The food technologies laboratory of the Mali ‘Institut d’Economie Rurale (IER) has provided her assistance for the production of juice samples. Hotels like the Azalai Salam Hotel group and other customers have already shown interest in the products. MAIH, a pioneering public-private partnership, addresses the needs of entrepreneurs and smallholder farmers through incubation services including access to technology know-how, skills development, training, and business development, access to office space, equipment facilities and financial resources. One important target of MAIH is entrepreneurship and job creation especially amongst the youth through entrepreneurship development programs. The headquarters are located at ICRISAT, Samanko. The operations for Youth Business Incubation; and Incubation units of Seed Business and Agro Processing Business are carried out from ‘Institut Polytechnique Rural (IPR), Katibougu and IER, Sotuba, respectively. MAIH is promoted by IER, ICRISAT, ‘Institut Polytechnique Rural (IPR), CORAF/WECARD (West and Central African Council for Agricultural Research and Development), Agri Business Incubation Network (AAIN), UniBRAIN Forum for Agricultural Research in Africa (FARA). 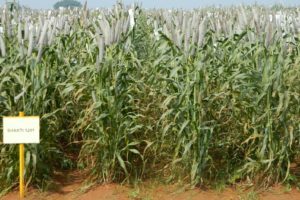 The need for breeding blast-resistant pearl millet varieties was strongly voiced by breeders from seed companies, who attended a field day held at ICRISAT headquarters recently. Pearl millet blast, caused by Pyricularia grisea, has emerged as a serious disease of pearl millet hybrids in India in the past 7-8 years. Host plant resistance is the most economical and viable disease management strategy to control the disease. However, resistance in the commercial hybrids being grown in India is not available as no efforts were made in the past to breed for blast resistance. Screening for drought and genetic resources. The participating scientists selected 5,786 breeding plots of which 1,194 were unique seed parents and 1,513 unique restorer parents. The most sought-after traits in pearl millet were – thicker and longer panicle with compactness and heat tolerance. The forage-type breeding material developed by ICRSIAT was appreciated and special mention was made by Dr PK Ghosh, Director, Indian Grassland and Fodder Research Institute (IGFRI), Jhansi, India. The newly-developed open pollinated varieties (OPVs) and hybrids have a high green biomass potential of 50-60 tons per hectare compared to the normal output of 15-20 tons per hectare in India. Participants also felt that there is need to strengthen the restorer development for the more stable A4 and A5Cytoplasmic Male Sterility (CMS) systems. The participants gave their feedback on the potential usefulness of the materials they saw and provided critical inputs to further strengthen ICRISAT’s pearl millet crop improvement program. Field-based screening protocols for downy mildew and blast. 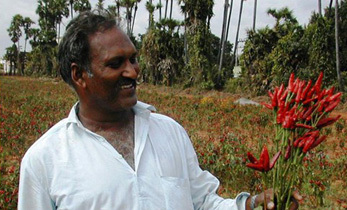 N Rai, Former pearl millet breeder at ICRISAT. Dr Rai stressed on the need for participants to share information on the combining ability of lines selected by breeders during previously held field days as this is a vital input for further research. The field day was attended by 29 participants from the public sector and 46 from the private sector, who are members of the Pearl Millet Hybrid Parents Research Consortium (PMHPRC), including two scientists from a Brazilian seed company. 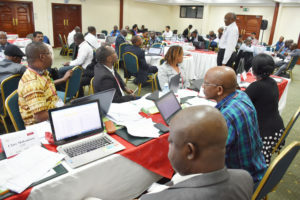 ICRISAT scientists from Eastern and Southern Africa; and West and Central Africa regions participated in the event and selected hybrid parents of their choice to strengthen hybrid pearl millet program in their regions. The field day held on 27 and 28 September was organized by the Asia Program – Crop Improvement (Pearl Millet Breeding). L to R: Dr Kiran K Sharma, Dr David Bergvinson, Dr Krishna M Ella, Dr H Purushotham, Dr Hiroshi Uchida and Dr Saikat Datta Mazumdar at the inaugural session of the Asian Science Park Association 20th Annual Conference. The potential of science and technology parks (STPs) to foster diverse innovative technologies and transform them into successful business enterprises that can benefit society was deliberated upon at the 20th annual conference of Asian Science Park Association (ASPA). 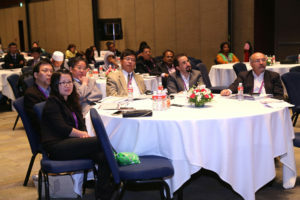 This is the first time the conference was held in India. The conference sought to facilitate strong linkages between India and Asia-Pacific countries and their stakeholders in science and technology for cross border exchange of ideas and technologies. Dr Hiroshi Uchida, President, ASPA, urged partners to leverage on the newly acquired Special Consultative Status of ASPA with the United Nations. “I believe this will help us in taking our science park to the global platform,” he said. Close to 150 industry experts from 11 countries congregated to hear from 30 top management industry experts. Plenary discussions, panel debates and case studies delivered practical insights on where the STP ecosystem is heading to, how STPs should look beyond the conventional government-supported R&D model which is limited in scope and budgets. Some of the case studies illustrated how science parks are playing an important role in the economic development of Taiwan and how unique public private partnerships in South Korea have helped local companies with high growth potential. The conference had technical sessions on cutting-edge issues in this space and leaders in the industry explored in-depth issues pertaining to science and technology parks for start-ups, translational research platforms and challenges and opportunities in public-private collaborations in Asia. Dr H Purushotham, CMD, National Research Development Corporation (NRDC), said that the Government of India realizes the importance of Technology Business Incubators (TBIs) and STPs for creating wealth and employment. “All departments have been instructed to create such platforms. NRDC identifies potential R&D outcomes, evaluates it for market potential and helps in its licensing,” he said. The importance of fostering innovation was reiterated by Dr Krishna M Ella, CMD, Bharat Biotech International Limited and Ms Deepanwita Chattopadhyay, Chairperson and CEO, ICICI Knowledge Park (IKP), Hyderabad. Mr Ram Kaundinya, Independent Board Member, Syngenta India and Axis Bank, said that technologies should get commercialized for the common person to benefit and that STPs have a major role in making this happen. “The policy environment should be futuristic and non-bureaucratic and the role of private sector in driving innovations is important,” he said. Dr David Bergvinson, Director General, ICRISAT, urged all stakeholders to leverage on their synergistic expertise to promote demand-driven innovations to address the needs of the society. “I urge such partnerships to keep in mind the need for addressing global challenges which include poverty, malnutrition, hunger and the looming challenge of climate change as part of their strategic interventions,” he said. Technical tours to ICRISAT, IKP, T-Hub and Gubba Cold Storage offered avenues to understanding the operations and success of Indian STPs and Business Incubators. The conference titled – Innovation sharing and collaborative opportunities in Science & Technology for advancement in Asia & Asia Pacific – was organized jointly by ICRISAT and the Hyderabad Visitors Convention Bureau (HCVB) in India from 19-22 October. 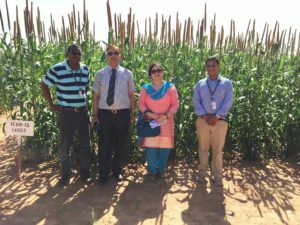 The ICRISAT team was led by Dr Kiran K Sharma, Theme Leader – Agribusiness and Innovation Platform, Innovation Systems for the Drylands Program; and Chairman of the ASPA-2016 Organizing Committee. The next ASPA annual conference will be held in Vietnam. 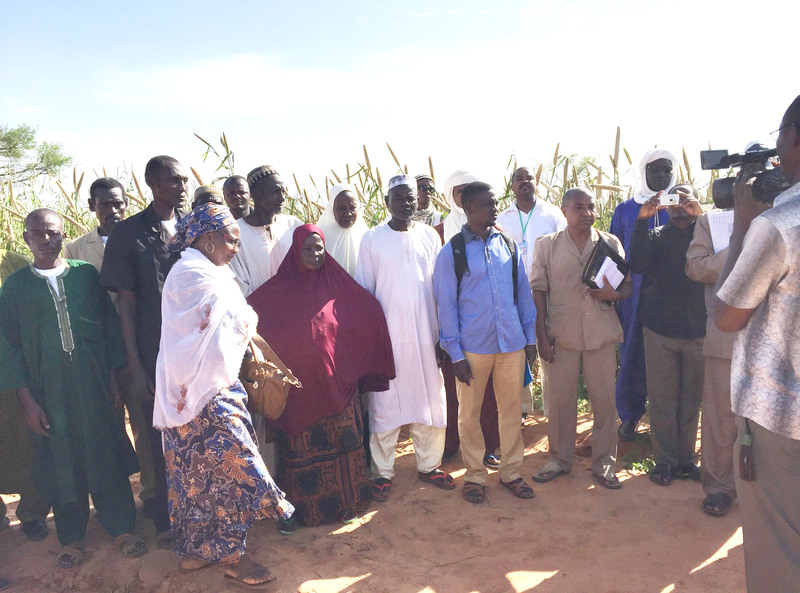 The newly developed open pollinated varieties and hybrids of pearl millet were showcased during a field day in farmers’ fields near Yuri in Niger and also at the ICRISAT research center at Sadore. As part of the program, a farmer participatory varietal selection was conducted during the field day. Farmers, seed companies and NGOs were asked to select the new varieties and hybrids based on their interest. This exercise helped to better understand the requirements of the farmers in different regions of Niger. The selected varieties and hybrids will be produced in the next season to showcase these varieties and hybrids in the farmers’ fields in coming days. The newly developed ICRISAT-bred pearl millet varieties with high grain Fe content were planted in farmers’ field and also in Sadore for demonstrations. The new varieties are ICTP 8203, GB 8735, ICMV 221 Wbr, ICRI- Tabi and Jira Ni along with hybrids ICMH IS 14002, ICMH IS 14003, ICMH IS 14009, ICMH IS 14011, ICMH IS 15012, ICMH IS 16265 and ICMH IS 16266. Varieties selected by participants based on their regions’ need included ICTP 8203 and ICMV 221 Wbr and hybrids such as ICMH IS 14002, ICMH IS 14003, ICMH IS 14009, ICMH IS 14011, ICMH IS 16012 and ICMH IS 16265. During the field visit, the seed kits of 250 g of ICTP 8203 seeds were distributed to each farmer for sowing in their fields next year. After the visit the AINOMA seed company expressed interest for training in hybrid seeds production. An AINOMA technician will come to ICRISAT as an intern for field training during the off-season trials. This work was carried out in partnership with HarvestPlus. The Indian Ambassador, His Excellency Mr RS Malhotra inaugurated the field day and visited the pearl millet demonstrations in Sadore research station and in farmers’ field at Yuri. He also visited ICRISAT research facilities such as abiotic stress studies platform, genebank and micronutrient soil analytical laboratory. He appreciated the research being conducted at Sadore and the ICRISAT facilities at Niger. Around one hundred participants representing national partners, Institut National de la Recherche Agronomique du Niger (INRAN), farm unions, various NGOs, Ministry of Agriculture and seed companies (AINOMA seed company) across Niger witnessed the field day and appreciated the newly developed varieties and hybrids. To identify the genomic regions and genes associated with aflatoxin resistance in groundnut using a combination of genomics approaches, a new research project was launched. Aflatoxins are among the most potent mycotoxins, carcinogenic and teratogenic compounds. Groundnut and maize are the most susceptible to aflatoxin contamination. One of the main objectives of the new project is to validate the identified genes and develop diagnostic markers so that they can be deployed in molecular breeding for developing superior lines with enhanced aflatoxin resistance in addition to other desired agronomic and productivity traits. The project ‘Identification of markers and genomic regions associated with aflatoxin resistance in groundnut’ is funded by the Mars Inc., USA, for a period of three years. A five-member delegation led by Dr Victor Nwosu, Technical Director, Mars Inc., attended the project launch meeting. “Consumption of contaminated groundnuts is silently deteriorating the immune system of the consumers which has profound adverse impact on human health, even more than estimated. 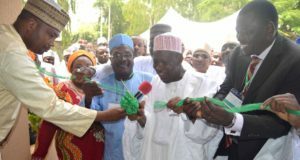 The outcome of this project will help in developing aflatoxin-free groundnut varieties, to provide high quality raw material to develop export quality products,” said Dr Nwosu. Dr David Bergvinson, Director General, ICRISAT, highlighted the importance of the proposed research for finding genetic solutions to aflatoxin contamination thus providing a sustainable solution to this menace and helping in developing aflatoxin-free groundnut varieties so that the poorest people can afford to have safe and healthy groundnuts for consumption. Dr Manish Pandey, Scientist-Groundnut Genomics, Research Program-Genetic Gains, spoke of ongoing work with Mars Inc. in another project which targets developing short duration, drought tolerant, foliar disease resistant and good oil quality groundnut varieties using genomics tools with high level of success and are confident on developing the required improved varieties very soon. ICRISAT has successfully deployed marker-assisted backcrossing (MABC) for developing improved lines for foliar disease resistance and oil quality in groundnut. Several of these lines are under multi-location trials in India for potential release as superior varieties. To improve the resilience of poor households to climate risk in the resource-constrained farming systems of the semi-arid ecology of Niger a project funded by the European Union was launched. Improved technologies of soil fertility, water harvesting and agroforestry systems. A crosscutting objective of the project is focused on sustainable increase of agricultural productivity and nutritional values of agricultural products, reduction of poverty by the strengthening local value chains of high value crops and trees for income generation, especially for women and youth. The project titled “Enhancing resilience to climate change through the dissemination of integrated management technologies: Soil-water-Agro-pastoralism” is designed using an integrated systems approach targeting the development and scaling of CSA innovations to improve the resilience in two of the poorest regions of Niger, Dosso and Zinder. This systems approach will be used in designing resilient farming systems to improve livelihoods and incomes. 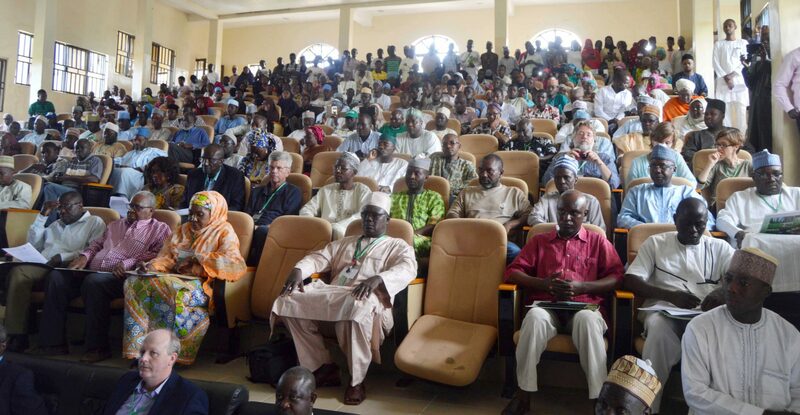 “This is an opportunity to link different initiatives and actors to CSA in Niger, for example our work on the restoration of degraded lands for food security and poverty reduction in collaboration with ICRAF (World Agroforestry Centre) and funded by International Fund for Agricultural Developmen (IFAD) and European Union (EU),” said Dr Anthony Whitbread, Research Program Director, Innovation Systems for the Drylands, who was present at the launch and involved in several initiatives in the region. 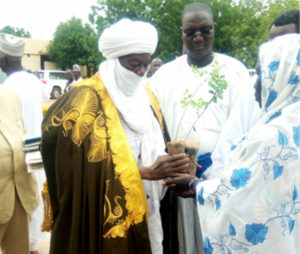 The Governor of the region, His Excellence Moussa Ousmane, Representative of the Government of Niger commended ICRISAT for its dedication to the cause of poor smallholder farmers, particularly in the Sahelian region in Niger. 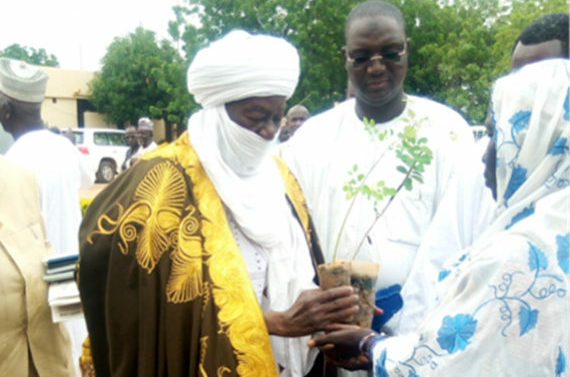 Mr Saibou Tamoudari, Prefect of Dosso, appreciated that the project addressed the issue of climate change. The project was launched at Dosso on 24 September and Zinder on 1 October. 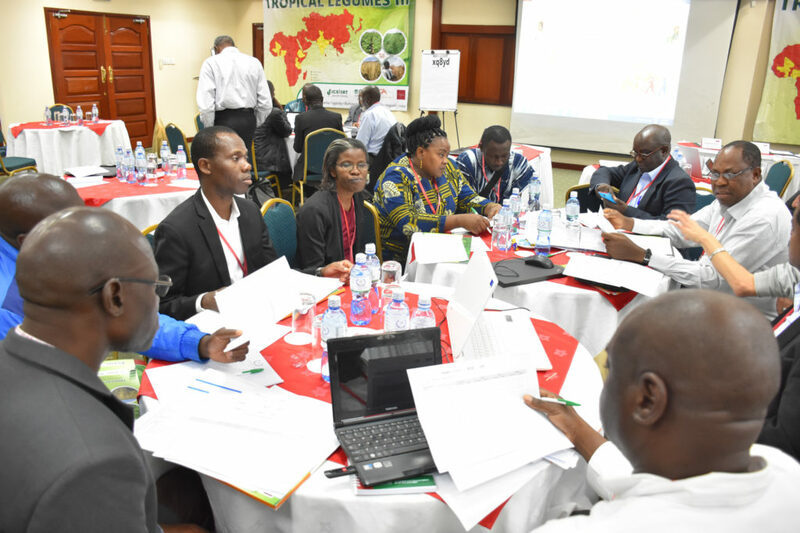 Region-wise Program Improvement Plans for target crops – groundnut, chickpea, cowpea and common bean – were presented at a recent Tropical Legumes (TL) III Genetic Gains workshop. The workshop used the results of the Breeding Program Assessment Tool (BPAT) as a resource to help guide breeding programs in improving their targeting, speed, scale, efficiency, quality (control, precision, and accuracy) according to each partner’s unique characteristics and resources. Building modern foundation seed stores. 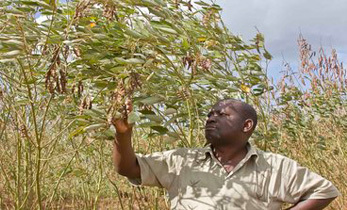 Key traits identified for development included early maturity, foliar fungal disease resistance, drought tolerance, groundnut rosette disease resistance, P-efficiency, tolerance to aflatoxin contamination and nutrient-use efficiency to meet the needs of poor soil fertility in Ghana, Burkina Faso, Tanzania and Uganda. Partners realized the most immediate improvement they can make in their breeding program is increasing the cropping cycle by at least one cycle per year to translate the enhanced breeding efficiency. Materials received from ICRISAT for foliar fungal disease resistance were useful and a few adapted lines were selected and promoted to advanced trials. It was also noted that an internal mechanism in CGIAR centers is required to incentivize breeders for sharing of breeding lines with NARS partners. NARS partners were encouraged to engage and invite objective leaders of TL III to their annual work-planning meetings which may provide guidance on collaborative activities to be carried out. The common objective presented across the countries was to develop market preferred varieties with drought tolerance, pest and disease resistance and improved nutrition. To achieve this it was recommended to increase number of nurseries, number of crosses, breeding trials and sites. Partners were of the view that to improve quality, higher precision phenotyping is required. There is a need for measurement of genetic gain, better data capture and seed storage facilities. NARS partners presented the program improvement plan for each legume in a crop by country combination – chickpea in Ethiopia and India; common bean in Ethiopia, Tanzania and Uganda; groundnut and common beans in Tanzania and Uganda; groundnut and cowpea in Burkina Faso, Ghana, Mali and Nigeria. Strategic partnerships for winter nurseries at government stations in Malawi (early leaf spot and groundnut rosette disease), Naliendele Agricultural Research Institute (NARI) Tanzania for rust or shuttle breeding between WCA and ESA to speed up generation advance. Recruitment of an additional breeder and postdoctoral researchers for molecular breeding and host plant resistance entomologist, etc. The other key traits include cooking time and yield. Already using electronic data capture tools; increase use of automated data collection. Use electronic data capture tools; increase use of automated data collection. All partners expressed satisfaction that the BPAT exercise added value to their programs. Dr Jeff Ehlers, Senior Program Officer, Bill & Melinda Gates Foundation, commented that BPAT can be used in an advocacy role: pushing national programs and CGIAR centers to deliver more efficiently. Dr David Bergvinson, Director General, ICRISAT, said that BPAT assessment should be extended to other locations as well. Dr Moses Siambi, Regional Director- ESA, emphasized on the need to increase production and productivity of the four key legumes under TL III in order to meet the high demand in project focus geographies. “With our integrated efforts we not only need to enable smallholders to move from subsistence farming to marketable surplus production but also ensure better nutrition and health,” he said. Dr Ehlers commended the partners’ effort for bringing in a real change in mindset and thinking of NARS and other partners and he also appreciated the visible efforts of incorporating the outcomes of the BPAT for improving the breeding programs. He also suggested the need to have the benchmark studies and document the reports on the genetic gains in key breeding programs. Dr Rajeev Varshney, Research Program Director – Genetic Gains, ICRISAT, encouraged the partners to utilize the ICRISAT genotyping platform/high throughput phenotyping and genotyping facility. He urged the Crop Improvement Breeding and Genetic Gains units of ICRISAT to work closely for better integration of the breeding activities and genomics. The workshop on ‘Increasing the Genetic Gains of Project Partner Breeding Programs’ was held from 1-2 September at Nairobi, Kenya. Partners: CIAT, IITA, and NARS partners from sub-Saharan Africa and South Asia. 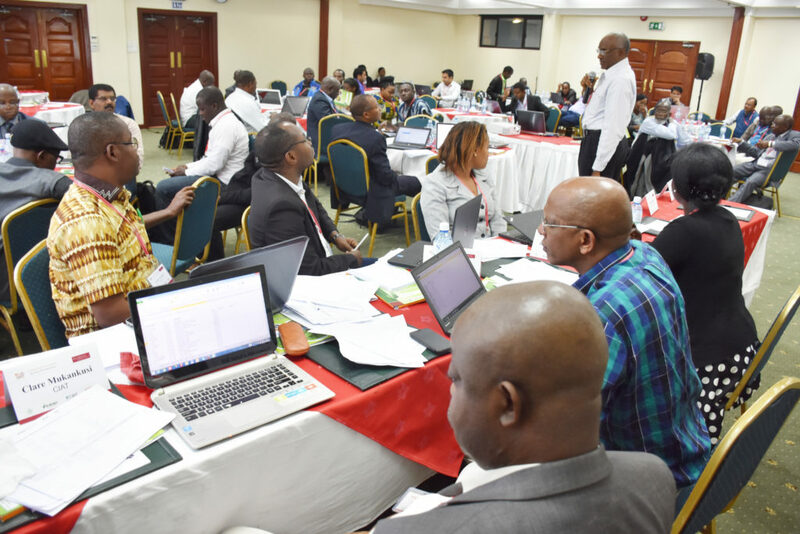 A Monitoring, Learning and Evaluation (MLE) work plan to document the roadmap to achieving the Tropical Legumes (TL) III project aim was prepared by participants attending a workshop in Kenya. The TL III project aims at releasing 50 high-yielding, stress resistant, market preferred varieties with superior cooking and nutritional qualities of groundnut, cowpea, common bean and chickpea by 2019.
will help the team to achieve this. Dr Jeff Ehlers, Senior Program Officer, Bill & Melinda Gates Foundation applauded the efforts of all the TL III partners and stressed that at the donor level, the Foundation sees the National Agricultural Research System (NARS) as key implementers for the third phase of the project. He also reminded the need for return on investments (ROI) for funds, but above all, synchronizing the work being done with national strategies in order to have bigger impact. He was happy to point out the investments in national institutions like the Ethiopian Institute of Agriculture (EIAR) were bearing fruit. “We need to continue documenting adoption of improved varieties and technologies developed as part of this project. We need to avail indicators of successful return on investments: what has been achieved and how confident we are on what has been reported. The Foundation is interested in knowing what NARS is doing, their capabilities and how we can measure these successes better while adopting the MLE plan,” he said. Addressing the participants Dr David Bergvinson, Director General, ICRISAT, highlighted the need to develop market-driven varieties and define the research agenda to answer the concerns along the production chains like: what are the market requirements? Who are the partners needed for its delivery? Who are the actors involved throughout the chain? He emphasized on role of engaging with policy makers and urged the CGIAR leaders to be ambassadors to strive for policy reforms. He urged the project partners to synchronize the plans to the country strategies; look for avenues to unlock markets, and document the constraints, enabling policies and partnership environments needed to unlock markets. During the two-day deliberations MLE consultant Dr Yvonne Pinto, Director of Agricultural Learning and Impacts Network (ALINe), Firetail, sensitized project partners on TL III MLE principles, highlighted the detailed functioning of MLE, reiterated the objectives, theory of change, elaborated MLE framework and the significance of MLE to TL III project. Mr Amos Kioko, Project Officer – MLE, facilitated and educated the participants on filling of MLE data collection tools and forms. Objective-wise groups were formed to have better integration and synergy while filling the MLE forms and reporting on the project development. Project indicator reference sheet was discussed to provide guidance on definition of terms, calculations, type of indicator, level of aggregation, data disaggregation, method of data collection, data sources, frequency of data collection, persons responsible, etc. Percentage of women using improved technologies, percentage change in gender yield gap along with number of improved legumes varieties developed and released, number of improved legumes varieties available for national testing, number of farmer-preferred varieties released in the national system, number of participants reached/ awareness created were some of the important indicators discussed as part of the MLE indicators. The Breeding Management System was also discussed as a tool for data management and reporting. It was suggested to track the average age of variety in a particular country to understand the genetic gains in farmers’ fields. Dr Stanley Nkalubo, Scientist from National Crop Resources Research Institute (NaCRRI), Uganda, urged NARS to look at the country strategies and what works are being done to improve the nutrition and food security in the country. 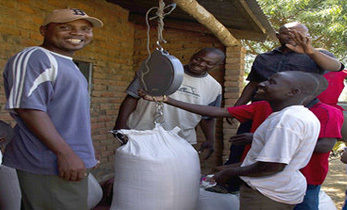 He cited the example of how iron-rich beans released under this project are helping in the fight against anemia in Uganda. 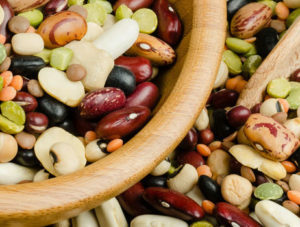 currently in its eighth year and there is need for ex-post assessment of the success achieved and project the future of legumes when the project ends in 2019. There is a need to plan on how to attract youth to replace the ageing generation of farmers. The way farming should be practiced must reflect the changing environment to encourage more youth to join agriculture, he said. Underlining the importance of efficient data management and use of Breeding Management System (BMS) discussions were facilitated by Dr Rajeev Varshney, Research Program Director – Genetic Gains, ICRISAT and Principal Investigator, TL III, with NARS partners to finalize the target locations per country and identify the country focal points. It was decided that assessment of existing capacities on data management and BMS of NARS partners will be done and accordingly plans for trainings and implementation of BMS and data management strategy will be developed as follow-up activity. 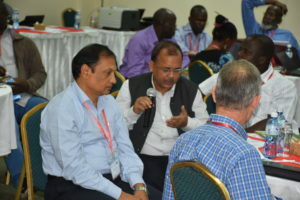 The workshop was held on 30-31 August and was attended by more than 60 participants from CIAT, IITA, the Bill & Melinda Gates Foundation, ICRISAT and NARS partners from sub-Saharan Africa and South Asia. Farm managers from Indian state universities, private seed companies and ICRISAT staff in Africa underwent training on themes such as Sustainable management of natural resources, Factors affecting research results and coping with errors, Effects of climate change on pests and diseases, and Weed management. The interactive program included lectures and presentations by ICRISAT scientists and staff of Farm and Engineering Services, farm visits showing various field operations, and demonstration of machinery operations. Eleven participants attended the training program organized by the Farm and Engineering Services, Research Program – Asia from17-22 October at ICRISAT headquarters. In an effort to introduce new technology into plant breeding programs, members of the Poland Lab at Kansas State University have developed several free PhenoApps for collecting data with Android smartphones and tablets. By fundamentally designing these tools for plant breeders and geneticists, the group hopes to improve specific areas in the plant breeding process where data management remains difficult. 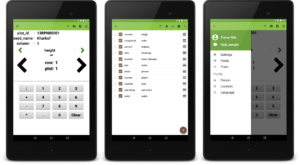 Field Book, developed to replace paper field books, gives breeders a simple interface to collect data on field research plots. It was created because other digital note-taking tools were too complex, didn’t allow for fast and flexible data entry, or were prohibitively expensive. Field Book reduces transcription errors, seamlessly collects metadata, and allows for rapid data analysis. Data collected is further enhanced because of its digital nature, providing the ability to capture photos and other custom data types. OneKK is an app designed to analyze seed lots. Its name comes from the one thousand (1K) kernel weight commonly used as a selection criterion in plant breeding programs. OneKK extracts individual seed length, width, and area from images captured by phone and tablet cameras. Reference circles of known size are included to translate the pixel measurements of seeds to actual size. For measurement of thousand kernel weight, the total number of seeds are counted and divided by the total weight. Inventory is an app that interfaces with a USB Scale to quickly weigh and categorize barcoded samples such as seed stocks or harvest bags. In addition to the Box and Sample ID, a timestamp and the name of the inventory taker are collected. Data is exported to a text file that can be directly uploaded to a central database. Inventory makes collecting weight data significantly faster, decreasing the amount of time needed for data collection and increasing plant breeding efficiency. Coordinate is a data collection app based on defining templates and then collecting data in grids created from those templates. Templates are highly customizable including custom fields for metadata collection, row and column naming, and rules for cell exclusion. All collected data is saved internally and can be exported. Coordinate comes with two default templates: a seed tray used for organizing samples to be planted and a DNA plate used for associating tissue sample names with specific wells. One of the principal advantages of relying on a mobile platform is that it allows updates and new features to be rapidly disseminated to users. These freely available and open-source apps have been installed more than 2400 times across the world. More information about all of these apps can be found on the Poland Lab website (www.wheatgenetics.org/apps) or by emailing Trevor Rife (trife@ksu.edu). Future PhenoApps will address additional data bottlenecks in breeding programs including managing crossing blocks, collecting specific geospatial data, analyzing root phenotypes, and further ensuring data integrity. Dr Eng Hwa NG, Theme Leader- Forward Breeding, Genetic Gains Program, ICRISAT. 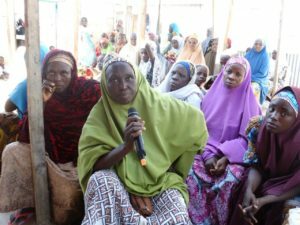 Leader of the women’s group Mrs. Hadja Hauwa Audu (with a microphone) and other members of the Yadokori Women Community center in Garum Malam, supported by WOFAN, Nigeria. Mrs Salamatu Garba is the Executive Director of Women Farmers Advancement Network (WOFAN), an NGO in Nigeria that coordinates the activities of smallholder farmers to help them practice sustainable agriculture. Agathe Diama in a freewheeling conversation spoke to her about the role of rural women in agriculture. Q: What is your vision of sustainable agriculture? Salamatu Garba: Sustainable agriculture and development is a holistic approach that addresses the welfare of the farmer and his importance to society. Society has made the farmer feel that his is a vocation that you take up when you are not important or when you fail in school! Sustainable agriculture is about giving the farmer a voice that will make him more relevant across the whole value chain, from production up to marketing and consumption. It also means putting in place processes that continue long after a project has withdrawn its support and about caring for the environment. Q: What in your view are the most critical constraints to agricultural development in Africa? Salamatu Garba: You can’t win a race running on one leg! Both legs must go together. Similarly, we must enhance agricultural technologies with simple hand operated machines, planters, and harvesters for women. You can’t let women continue with hard labor for three days and pay them half a dollar for that! Let them own their businesses, let them be engaged in uptake, let them link to markets. Q: Tell us about some of WOFAN’s activities. Mrs Salamatu Garba, Executive Director, Women Farmers Advancement Network (WOFAN), Nigeria (left) with Ms Agathe Diama, Regional Information Officer, West & Central Africa Program, ICRISAT. Salamatu Garba: Partnerships are very vital to our work. WOFAN is working with ICRISAT as a lead partner. We are linking with agricultural development agencies and research institutions. When we consolidate our skills, farmers too follow this practice. We are improving processing and adding value. Our women are packaging groundnut and involved in nutrition programs. Basically we see food security and nutrition as a package. Groundnut has brought happiness in the family: the husband grows groundnut, WOFAN supports women in buying groundnut from the men to process it to extract groundnut oil. Everybody in Kano comes to WOFAN because they can buy unadulterated groundnut oil. If ICRISAT had not partnered with the Institute of Agricultural Research (IAR) to bring SAMNUT 23 and SAMNUT 24 varieties which give three times the value of oil we were getting before, we wouldn’t have been able to address current market needs. In the past, men would harvest but not talk about it to their wives. Now that the men know their women will buy the groundnut produce, they inform their women a week ahead of harvest since they know that money will come through the women. Currently nearly 4020 women are engaged in groundnut oil extraction while only 999 men are producing the crop. How can the voices of 75% of the total target not be heard? Today the family eats more nutritious food, pays the children’s school fees, uses fodder for livestock, which when sold brings in a good income. Q: Your views on crop-livestock system integration. Salamatu Garba: It is perfect to have an integrated system for agriculture and livestock; imparting business skills are equally important. It is not just about increasing production. It is ridiculous to think of increasing agricultural production without factoring in wastage, which is the biggest problem in Africa. We are producing enough but we lose a very high percentage of it after harvest. Q: What makes a good woman leader? Salamatu Garba: To become a woman leader, one must have very big ears and a small mouth. You use your ears to listen to people; you let them come up with their solutions. It is very important to make people own the process. Being humble is another quality. Listening to people and getting a response is like physics: How the ball returns will depend on how you throw or hit it! Q: Organizations working on behalf of rural women/farmers are often accused of ignoring their aspirations and needs. How does WOFAN ensure this does not happen? 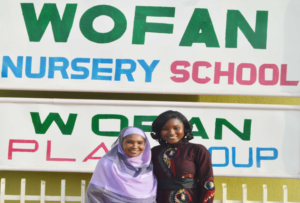 Salamatu Garba: Group dynamics is very important in WOFAN. For instance, before we began with groundnut processing we did a lot of group interactions to give them the confidence to be independent and fearlessly express their problems. Then we stepped back and let the women take center stage. Our women farmers who were once timid and quiet now hold the microphone and tell the governor exactly what they want! This is also part of scaling-up agriculture. The approaches you highlighted for building climate-smart farming communities (Happenings, October issue) can also be adopted in the Philippines. With a US$10 million funding our approach is an integrated farming approach using your approaches and renewable energy which we call GET SMART Farms (Green Energy Technologies for a Systematic, Modernized Appropriate Rural Technologies for Farmers Sustainability). This will now provide irrigation to 1,000 hectares benefiting 1,000 or more farmers in a cluster of communities. 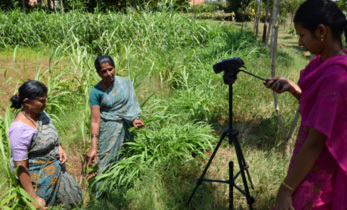 ICRISAT’s approaches to building climate-smart farming communities is very interesting. Please add that the increasing number of nurseries in rural areas for medicinal and aromatic plants that grow in the arid and desert regions is also a tool to climate change adaptation, mainly for women, who generally feed the family.